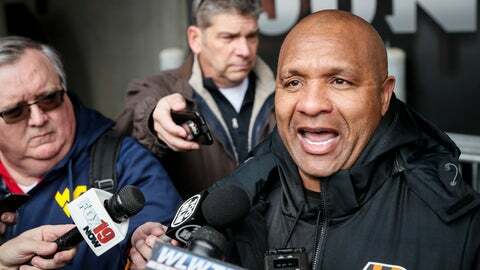 CINCINNATI (AP) — A jogging Hue Jackson didn’t break stride as he left the practice field. The recently fired Browns head coach was trying to outrun questions about what it’s like being on the opposite sideline this week. Jackson left Cincinnati after the 2015 season and spent two-plus seasons trying — futilely — to get the Browns to win. Now he’s back in town , trying to beat them in a pivotal game. He’s hoping his insights give the Bengals (5-5) an edge Sunday in the intrastate rivalry. The stakes are high for Cincinnati, which has dominated the series lately and wants to keep it that way. The Browns (3-6-1) merely would like a victory away from the shore of Lake Erie. Cleveland has lost 25 consecutive road games, one shy of the NFL mark held by the Detroit Lions from 2007-10. The Browns’ last win on the road came at Baltimore, where Josh McCown led them to a 33-30 overtime victory on Oct. 11, 2015 — back when Jackson was the Bengals’ offensive coordinator. Whether the streak endures or ends will come down to whether the Bengals figure out a way to stop Cleveland’s rookie duo on offense. Last week, Ravens quarterback Lamar Jackson and running back Gus Edwards became the first rookie QB/RB duo to run for at least 100 yards in the same game, leading Baltimore to a 24-21 victory over Cincinnati. The Bengals have given up more than 200 yards rushing in each of the last two games. By contrast, Cleveland beat Kansas City 28-16 before heading into its bye week. Rookie Baker Mayfield tied a club rookie record with three touchdown passes, and rookie Nick Chubb ran for a career-high 176 yards, including a 92-yard touchdown that was the second-longest by a rookie in NFL history. Can they do it again against their former head coach? How much can Hue Jackson tip the outcome? Sure, he knows the Browns’ systems intimately and the players personally, but having the bye week allowed Cleveland to change some things. “In all honesty, there are no secrets anymore in the league with how all the film is out there to show everybody exactly what you’re doing,” Brown interim coach Gregg Williams said. The Bengals fired defensive coordinator Teryl Austin after becoming the first team in the Super Bowl era to allow 500 yards in three straight games. Coach Marvin Lewis assumed the job of defensive coordinator as well as hiring Jackson as a special assistant on defense. The change didn’t make enough of a difference as the Bengals got run over in Baltimore. Their main focus this week is stopping Chubb. “We know that’s their emphasis right now and that’s what they’re going to try to attack us with because that’s our perceived weakness right now,” defensive end Carlos Dunlap said. The Bengals have won seven in a row against the Browns, the longest winning streak by either team in the intrastate series. The Bengals have won the last seven by 30, 21, 34, 14, 13, 24 and 24 points. The Bengals are 7-1 against Browns rookie quarterbacks under Lewis, who is in his 16th season. The only loss was 34-24 at Cleveland in 2012 behind Brandon Weeden. Cleveland hasn’t won two straight games since 2014, when the Browns reeled off three in a row while improving to 6-3 under then-coach Mike Pettine. That seems like an eternity ago for the Browns, who have gone 8-56-1 since that modest run. While the game has significance for Cincinnati’s playoff hopes, the Browns aren’t yet finished ruminating about the postseason. They’d likely have to win their last six games to end a playoff drought dating to 2002.